"Not enough time for a plan," business people say. "I can't plan. I'm too busy getting things done." The busier you are, the more you need to plan. Too many businesses make business plans only when they have to. Unless a bank or investors want to look at a business plan, there isn't likely to be a plan written. If you are always putting out fires, you should build fire breaks or a sprinkler system. You can lose the whole forest for too much attention to the individual trees. A plan is worth the decisions it causes. If you already know your market, don't waste time or money doing market research. Don't do it just because somebody said it was part of a business plan. But are you sure? Is it worth a fresh look? You decide. The supporting information isn't part of your plan; it's just supporting information. Do you have to prove the concept? Will outsiders be reading your plan, and evaluating it? Does the market research prove something that must be proven? Then include it. Information in business is worth the decisions it causes. You measure this by taking a guess at what your bank balance would have been without the information and comparing it to what it is because you had the information. Subtract the hypothetical balance without the information from the balance with the information, and that's the value. That's a hard equation to deal with sometimes, and of course it's based on hypothetical values; but it's still an important concept to understand. Your business plan shouldn't include anything your business won't use. Either it's going to use the market analysis or it needs to present it as proof of market for outsiders -- or you just don't perform the analysis. The original title of this piece was "Business Plans Are Made, Not Found." It comes from my childhood memories of the Wheaties ad campaign of the 1950s. The slogan was "Champions Are Made, Not Found." The same applies to business plans. You make one, you don't find one. You develop your own. This idea comes up a lot these days because -- I think-- of sample business plans. The spread of sample business plans is a real problem for the greater good of business planning. And unfortunately, I might be part of the problem. Gulp. I started creating sample business plans at Palo Alto Software in 1987 with the first Business Plan Toolkit, which included the original versions of Acme Consulting and AMT, the computer reseller, which I had written for clients. Digression: If you're curious, Google one or the other and see how widespread it is. By the way, there are a few sites that use one of these examples with permission (the SBA, for example, has permission to use AMT as a sample on its site), but there are a lot of people just copying one and calling it their own. Seems like there are hundreds of them out there. Only a very, very few have permission. Most are pirates. End of digression. We came up with the idea of including sample plans with the business-planning product to help people understand what a business plan looks like, what it covers, and how it comes together. We included 10 real sample plans in late 1994 when we released Business Plan Pro. People liked the samples, so we included more. We polled the users and came up with 20 real plans from real businesses to include with our second version in February of 1996, and 30 sample plans for the third version, in May of 1998. People really liked sample plans as part of the product. Then the idea spread. People started buying and selling sample plans. Our life as market leader became very complicated when a competitor bought 100-some sample plans from a book compilation and included them as Adobe PDF files with some business plan software. That company didn't tell their customers that the plans were just electronic documents, didn't work with their software, and most didn't even have financial information, but they did cause a stir in the market. We had to work like mad to get 250 real plans, all of which worked with Business Plan Pro and had financial data, to compete. We sponsored business plan competitions, and paid our customers, looking for real plans. So the race was on. By this point we had our version 2002 (equivalent to the fifth version) of Business Plan Pro out. People started selling sample plans on the Web, most of them poorly-disguised knock-offs of our sample plans exported from Business Plan Pro and massaged slightly. We've had several legal battles with people using our work to compete against us. We're up to 500 sample business plans with Business Plan Pro now, and, frankly, I hate it. Here's the problem: When it was two sample plans or even 10 sample plans, people generally understood that the examples were supposed to give you an idea of what a plan is. Now with hundreds of sample plans available, some people naturally think their own business plan is supposed to be one of those 500. As an author and professional business planner, I hate this idea. People are buying and selling finished business plans as if they were term papers (also a bad idea) for college students. That trend is really spreading, and it's a mistake. Not just wrong because of plagiarism, but wrong because it doesn't work and clouds business planning. I get the question all the time: "Do you have a plan for X?" This brings me back to the title of this sidebar. I want to tell everybody that finding a business plan you can use is a really, really bad idea. You make a plan; you don't find one. Obviously, every business is unique. Every business plan is unique. Even if you happened to find a business plan for a business very much like yours, it would never have the same owners, the same management team, the same strategy, and probably not the same market or location either. Sure, I recognize that a sample plan can help in several ways. You can find out how somebody else defined the units and prices in a business, what her expense projections were and for what categories, and how she described her market. But I strongly recommend you start at zero, and write your own plan. Refer to samples for some hard points, perhaps, but start with an empty plan. If you're using Business Plan Pro, the wizard takes you through the process step by step, tells you what you need to include and why, so that you just tell your own story and do your own numbers. If you start with somebody else's plan it's going to be very hard to distinguish your own ideas from hers. You're going to end up with a hodgepodge of rehash. I just can't believe people are buying and selling sample business plans as stand-alone documents, but they are. It's bad enough that we have samples readily available for editing and modifying within the business plan software, but then you have several websites selling finished sample plans without any software, just as Word documents or worse. Most of these are the same plans recirculated, essentially stolen, but even that isn't why they are a bad deal. It's like buying a novel as a Word file and trying to get it published -- it's a bad idea. Adapted with permission from blog.timberry.com. All rights reserved. A good business plan is never done. 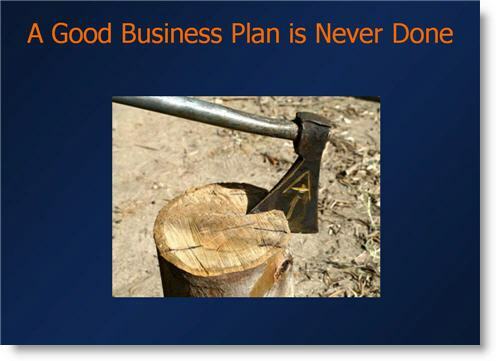 If your business plan is finished, then your company is also finished. It's a lot like the legendary farmer's axe, that has had its handle changed four times and its blade changed three times, but it's still the same axe. As your company gets used to the planning process, the business plan is always a work in progress. It gets a big refreshment every year, and a review and course correction every month. Every so often, as business plan events come up, you spin out of your business plan a formal output piece, whether it's a pitch presentation, an elevator speech, or a full-fledged formal business plan document. But that's not the plan, that's just output. It's the latest version. But the plan goes on, like steering, walking, dribbling, and navigation. Don't ever wait for a plan to be done. Get going.